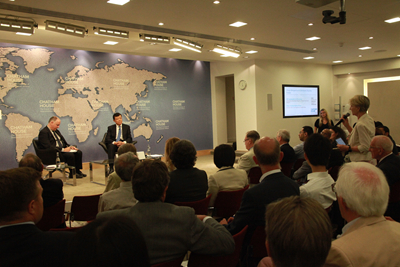 On 25 July 2016, following his keynote speech entitled "Let no fleeting clouds block our vision" at the Chatham House, H.E. 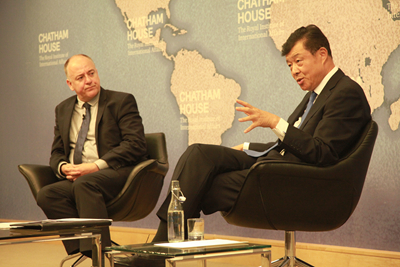 Ambassador Liu Xiaoming answered questions from the audience on issues including the impact of the US presidential election on China-US relations, the nature of the South China Sea arbitration, the legal status of the dotted line in the South China Sea, negotiation on the Code of Conduct in the South China Sea, China's construction on its islands and reefs, resource development in the South China Sea, the impact of the arbitration on China's relationship with neighbouring countries, disputes between China and Japan over the Diaoyu Islands, China's international influence, etc. Question: We know that there is an important election in America. America's role on the South China Sea issue is very significant, even though it has not ratified the UNCLOS. So what kind of opportunity or challenge do you see from Clinton presidency or Trump presidency for China-US relations and the issue of the South China Sea? Ambassador Liu: I think it's still too early for me to make predictions, but we have to be ready to deal with either of the two. Hillary Clinton was the Secretary of State, and she has visited China many times. We don't know Donald Trump that well. I read some Western media report saying that China might be concerned about the Trump administration. I'm not that worried. I had been working on China-US relations for years and had followed six presidential elections. I think I understand the American election politics. We listen to what they are saying today, but we must pay more attention to what they are going to do after the election. I'm confident that whoever becomes US president will set store by the national interests of the United States, and will attach importance to the relationship with China. I am confident about that. I believe that China and the US have a broad relationship. We may have some differences, there maybe up and downs in the relationship, but I believe what unite China and the United States is more important than what divide us. Question: Ambassador, thank you very much for your statement. You say that China is happy to negotiate on the South China Sea, and I think it will assist the negotiation if China could clarify the meaning of the dotted line, what is intended by the line, whether it is a claim for the rights of everything within the line, or it is the basis for China to generate for themselves maritime rights. It will be great for China to clarify it. And if I may ask another thing that the arbitration tribunal report also reviewed several fishing practice by Chinese fishermen including using the explosives in the South China Sea, one of the world's richest fishing grounds. So would you tell us what kind of steps China will take to put an end to these actions? Ambassador Liu: First I will say that China has long stood for resolving disputes through bilateral negotiations with our neighbouring countries on the basis of respect for historical facts and in accordance with the international law. It is not something that we put forward recently, and we are still behind the commitment. We do hope that the neighbouring countries and China will be engaged in diplomatic negotiations to find solutions content to both sides. Regarding the dotted line, this is something inherited from history, so are our territorial sovereignty and maritime interests as well as historical rights. It is based on many facts that China has been the first to discover, to name, to explore these islands and areas, including development and jurisdiction on these islands, and also including the fishing activities by Chinese fishermen. So the dotted line has been recognized by the international community since it was announced in 1948. No country, I know you are shaking your head, but no country challenged the dotted line until the 1970s, when natural gas was found. Then some countries rushed into this area and illegally seized, invaded, occupied 42 islands or reefs, 29 by the Vietnamese, 8 by the Philippines, 5 by the Malaysians. China has sovereign rights over all these islands. They are part of the Nansha Islands. So I think the dotted line has been on the map, if you check your record, the maps published officially by a variety of authorities by the US, France even Britain. They all show the dotted line, which is regarded as showing respect for the Chinese sovereignty over this area. With regard to the fishing activities, we are of course orderly managing the fishermen's activities. The government does not support any fishing activities that damage the fishing resources. That's one reason why we are also in discussions with the neighbouring countries to find solutions on how to put a good order to the fishing activities together. With regard to the fishing activities, I want to remind you that fishermen of some neighbouring countries have a lot of illegal damaging activities. So efforts are called for from China and its neighbouring countries to find a solution to this problem together. Question: Some people might have actually seen you saying there's zero possibility of the ruling of the international law being enforced, given that sovereignty has been ruled out of the UNCLOS. I was very concerned. You know a peaceful resolution of this very tense dangerous situation requires international law to be respected by all. But your side ruled out the possibilities for the peaceful solutions for all the parties. And when you talk about the bilateral negotiation between a big power and a small power, does it mean some kind of might is right in the 19 century style? Thank you! Ambassador Liu: When I say there is zero effect, I'm talking about the effect they have on China's territorial sovereignty, maritime rights and interests. You will not expect that China's territorial sovereignty and maritime rights would be affected at all by this arbitration. I think I made this point very clear, you could not expect there would be change because of the arbitration. If you expect impact on China's territorial sovereignty and maritime rights and interests, I think you will be wrong. You will never expect anything to happen in this respect. Arbitration is a very insufficient way to resolve this issue. China will not accept it. It violates the UNCLOS, and it is illegal. The UNCLOS puts the bilateral agreements, bilateral discussions ahead of arbitration. Arbitration will only apply when the state parties to the UNCLOS cannot resolve their problems by bilateral negotiations. So, I cannot agree with the argument that the tribunal is resolving disputes in accordance with the international law. China and the Philippines have reached agreements that we are going to have bilateral negotiations. These negotiations never took place because the Philippines thought they got the support from the United States. They believe they can get something from the arbitration case and are no longer having interests in talking with China. The tribunal violated the UNCLOS basic proceedings, but we remain committed to bilateral negotiations. It is endorsed again today by Foreign Ministers from China and the ten ASEAN countries, including the Philippines, in a joint statement pledging to implement the DOC in its full It's very interesting that the Philippines is one party of the new joint statement, which is also supportive of the bilateral negotiations between directly concerned parties as a means to solve disputes peacefully through dialogue and consultation. But on the other hand, they (the Philippines) still have illusions about these rulings. I do hope that they could get out of these dilemmas, the sooner the better. So that's why I'm saying that these things have no effect on China's rights and China's sovereignty over the South China Sea, and will not have impact on China's commitment to bilateral negotiations with neighbouring countries. We believe the only solution that can be lasting and enduring is that the related countries meet face to face rather than to have a tribunal arbitration imposed on a sovereign state. Just like here in this country, I do not foresee that if Britain wants to negotiate with the other countries through peaceful means to find solutions to their disputes, before you started these negotiations, an arbitration tribunal was imposed on you. I don't think you would accept that. You would believe that the sovereign country have a right to find a solution rather than to be faced with a tribunal case imposed on you. So that's what I'm saying. You talked about big country and small country. Although China is big in size, we always stands for the position that countries big or small should be equal. Out of China's 14 neighbouring countries, we have reached boundary agreements with 12. Some of them are very small countries, such as Nepal and Myanmar, but we have resolved this difficult border issues through peaceful and friendly methods on an equal footing. I think China is a guardian of international order and international law. We are still hoping that we can find solution to the disputes with the Philippines, Vietnamese, Malaysians and other countries. We can work together to ensure peace and stability in this region. Question: I have some strong words about your utility of the troops, and nice words about China's approach. But Mr. Ambassador, don't you think that building air strips on unoccupied reefs and sending ships of tourists create more attention than unilateral arbitration in the region? Ambassador Liu: China has always been calling for restraint. But some countries even started building military facilities on their illegally occupied islands. When the Philippines or Vietnam built air strips on the illegally occupied islands, the western media kept silent. Some western politicians turned a blind eye to this. In face of the provocations, China could not help but to built facilities to counter their measures. We are doing this on our own land. I hope you understand my point. Those countries went back on their words, built military facilities and deployed missiles, tanks and artilleries on the territory they illegally seized and occupied. And China is forced to make response to this. So I don't think China's actions have caused any damage to the region. On the contrary, China is building facilities that will provide public services in terms of meteorological research, oceanic research, and environmental protection. Building light houses is very helpful for safety of shipping in the South China Sea. Hundreds of thousands of vessels pass through the South China Sea. It has been appreciated by the local business people. I read earlier this year that the Reuters did a poll. Many ship owners appreciate China's efforts and they believe the public services and public goods provided by China in building these services, like light houses and other rescue facilities, really shorten the time of rescue, and has done a great deal to improve the environment of shipping in the area. And I think China is really committed to it. Having said this, I would encourage you to read the statement published today. Both China and ASEAN countries agreed that the parties concerned will exercise self-restraint. That shows the commitment China has made to maintain peace and stability in the area. Let me read this line, and I hope this helps you to understand the situation. "The Parties undertake to exercise self-restraint in the conduct of activities that would complicate or escalate disputes and affect peace and stability including, among others, refraining from action of inhabiting on the presently uninhabited islands, reefs, shoals, cays, and other features and to handle their differences in a constructive manner." Question: Mr. Ambassador, would you just explain a little bit more about how China plans to use the resources in the South China Sea, those resources under the sea bed, because presumably you do have ambitions for those resources? Could you explain a bit more about your plans? 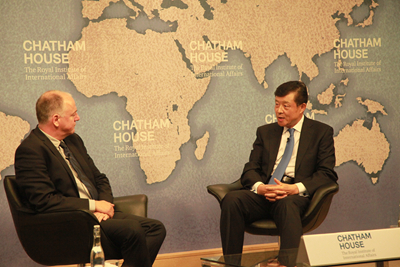 Ambassador Liu: As I said, China has legal maritime rights and interests in this area. And of course, there are some Chinese oil companies doing the drilling. You know that all these activities are within the scope of China's sovereignty. We realize the disputes in some areas and we are ready to talk to relevant countries about joint exploration and joint development. In fact, China and Vietnam reached agreement on some joint development programme. In fact there is a project among China, Vietnam and the Philippines. When it comes to the natural resource exploration in disputed areas, we are open to discussions with our neighbouring countries. Question: I have been studying China for a number of years, I found, your Excellency, your speech is an excellent presentation. Now to the question, do you think it is right for countries that do not sign the UNCLOS, or shall we say by proxy, make utilization of international law in a very disguised way. Is that indeed correct? Ambassador Liu: Absolutely not correct. Question: Thank you very much. Ambassador, I think you have explained China's position extremely well, and I think all of us have got a much better understanding on the arbitration decision that has zero legal effect. You don't accept for the reasons you explained. On the territory claims, you explained China's historical territory rights and you also explained China is developing public services in the South China Sea, building light houses, oil and gas exploration and other beneficial things. So why your neighbours don't accept this? Vietnam, the Philippines, not to mention, but also Japan. Is Chinese diplomacy not working? Why are your neighbours not accepting these issues? 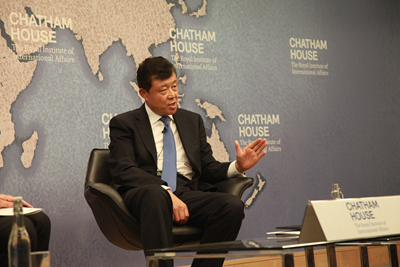 Ambassador Liu: I noticed when you say China's neighbours are not accepting China's policy, you used plural forms. I would say they are not the majority. The truth is, we have a very good neighbourhood. Our largest neighbour, Russia, has good relations with China. The DPRK where I had worked, South Korea, Pakistan, India, Kazakhstan, Nepal, Bangladesh, they all have very good relations with China. Even China's relationship with Vietnam is good, though it's very complicated. We fought a war against each other once. Relations between countries sometimes have ups and downs. What binds us together is interest. Indeed, some countries do not accept China's policy because they have maritime disputes with us. Take Japan for example. We have problem with Japan on the Diaoyu Islands. The islands should be returned to China, according to the Cairo Declaration. We believe the Diaoyu Islands is ours, but when we normalized relations with Japan, we did not want the issue standing in the way. Deng Xiaoping proposed to shelf the disputes. He believed the future generation would be wiser and would find a solution finally. So the status quo has been there for over 40 years. It was not until recently that the Japanese government wanted to, in their words, "nationalize" the island, and the right wing segment wanted to buy this island to achieve illegal occupation. They rocked the boat, and they forced us to respond to their provocative actions. The South China Sea is the same thing. China has been the victim, but we still believe countries, big or small, should be on an equal footing in bilateral negotiation to find solutions. We have been successful with Vietnam in settling some territorial disputes. We reached agreement on maritime delimitation of the Beibu Bay. I am not saying we are trying to copy what we have achieved between China and the Vietnam, but we are confident that we can find solutions. But we should be given time on these very complicated issues. Confidence and patience are required. Now we have the geopolitical factor. Some big country, much bigger than China, they want to use the issue of the South China Sea as an excuse for so-called "rebalancing strategy", to show their muscle and to show their presence. That makes things more complicated. That is something that we would not like to see. Question: Ambassador, nobody is bigger than China. You made very strong statement there. It's one of the strongest I've ever heard and China is very angry. Ambassador Liu: You found me very angry and emotional? Sometimes. People have feelings, right? Question: To some extent, I think the Chinese are very right to be angry. You're going to be very patient, and try not be angry. I'd like to get to the question of demarcation line and world order after the Second World War. Let's talk about the sphere of influence. How does your long term policy look in the sphere of influence? Where China will be in 20 to 30 years from now? Which parts of the Pacific do you feel you will consider as part of the post-war world order and as your sphere of influence? Because you have concerns about that. China, US and Russia have huge problems in common and we should be working with one another, not arguing about these islands of South China Sea. Could you talk a little bit on how you foresee China's sphere of influence evolving? Ambassador Liu: Sorry for saying this. I think you still use a cold war mentality to judge things. I am talking about post war order after the Second World War, not cold war order. This basic order is part of the international order that is guaranteed by UN Charter. And I can't agree with you when you say China's "sphere of influence". China has no interest in "sphere of influence". The number one reason is that, you said no country is bigger than China, and you are wrong from the very beginning. China is still a developing country. China is the second largest economy, that's for sure, but in per capita income, China is very much behind the 80th country, much poorer than the UK, to say nothing about the US. Per capita GDP is more important than total GDP, because that concerns the livelihood of the people. After my tour in Egypt, I was seconded to Gansu, one of the poorest provinces in China, as assistant governor. You probably have never heard of the name of that province. It is so poor that people even have problem getting drinking water. Many local people have to depend on purified rain water collected in a cell. There are still hundreds of thousands of people living in that condition. I traveled a great deal in that province. One of the purposes is get to know the reality of the country that I represent. Shanghai, Tianjin, Guangzhou is not all of China, just like London is not all of the UK. If you go to the north of England or Scotland, you will find a different country. That's the same with China. So China has enormous challenges to develop its economy and to let 1.3 billion people have a better and happier life. We are not interested in challenging the so-called American "leadership". We are not interested in building the so-called "sphere of influence". We are only interested in building our country to make China a more advanced and modernized country. Why do we care about these islands? China had been the victim of foreign aggression for over 100 years before the founding of PRC. Q: My family was there at the time. 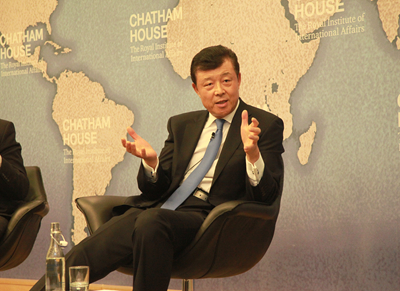 Ambassador Liu: Ok, so you will understand China even better. A lot of unequal treaties were imposed on China. China lost a large part of its land. Now China is an independent country standing on its own feet. The people care about their territory. As I said, we are not interested in an inch of foreign land if it does not belong to us. We are not jealous of it. But we will defend every inch of our land that belongs to us by every means available to us. So if you have been to China, you will understand a saying in China, that is, "an inch of land is more precious than an ounce of gold". So it is in the DNA of the Chinese people to defend our sovereignty, territorial integrity, and maritime rights and interests. Question: I am from the Japanese Embassy. Since you talked about Japan and Senkaku island, so I have to respond. First of all, for victimhood, we are not talking about history 70-80 years ago. So I do suggest we do not talk about victimhood but talk about the rule of law. China is a big country of the UNCLOS. By becoming a party of the UNCLOS, China has to accept articles on the disputes settlement and it must comply with. The UNCLOS has stated that the matter should be decided by the tribunal. So it is very clear that China is bounded by the treaty and by acceding to the UNCLOS. You cannot make both deals at the same time. In terms of Senkaku islands, in 1951 when San Francisco treaty was concluded, China objected, but from 1952 to 1971 China never claimed Senkaku islands. So we can sense a kind of manipulating use of history. It's a bit too much. Kerry Brown: Do you have any question? 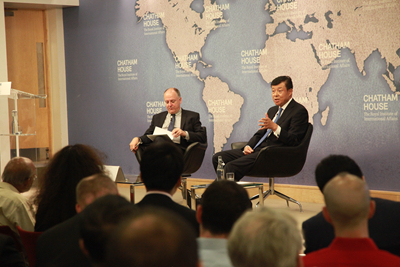 Ambassador Liu: You could apply for another opportunity to make a speech. I think this time the floor is given to me. What is your question? Question: I want to ask why don't you declare by which date that COC can be concluded? Please if you can specify the date of COC conclusion? Ambassador Liu: I think you have no right to ask me this question, because as I said, Japan is not a party to the negotiation of the COC. So when you ask China to set a deadline, I think that's too much. It's too arrogant, because this matter is up to China and ASEAN countries to negotiate. China already made its commitment that China will work actively with the ASEAN countries to reach the COC as soon as possible. Because this matter is very complicated -- it not only concerns China but also concerns the ten ASEAN countries -- and since China always treats others as equals and always respects others' views, China cannot set a date. As far as the Diaoyu islands are concerned, we can spend a whole day on this. This topic has been debated many times at the very top level and working level between China and Japan. One thing is certain, that is, you mentioned, San Francisco Treaty had never been accepted or recognized by China from day one. The Diaoyu Islands is part of China and was illegally stolen by Japan by means of war. This is the term used by the Cairo Declaration signed by leaders of China, UK and US that this islands, i.e., all islands on the Pacific Ocean stolen by Japan should be confiscated and returned to China. But we all know what happened at the end of Second World War. China was in the civil war, and had no ability to recover its sovereignty. And then the Cold War followed. Japan became America's ally. So they changed their mind and thought, why should they return the islands to China? I don't need to go back to history on that. Question: Thank you very much Ambassador. You made a very strong argument on the issue of the South China Sea. You begin by saying that the Tribunal does not have jurisdiction on territorial sovereignty and maritime demarcation and you are right. The tribunal says repeatedly that it does not have. My question is that why the Chinese government representatives keep talking about that the tribunal has violated the territorial sovereignty and maritime delimitation? Actually they are not. Ambassador Liu: Talking about sovereignty, I think it's very clear that this is the whole purpose of the Philippines' arbitration case. They want to use the arbitration to deny China's sovereignty over the islands. That's the basic logic. I don't know how much they spent. Some say they spent 30 million dollars on the lawyer fee. They spent that large sum of money just for a ruling on the nature of uninhabitant islands? I think they are not that stupid and mad. I think the purpose is to use this tribunal's ruling to deny China's sovereignty and maritime rights. That's very clear. Anyone who has no bias, to say nothing about the experts, should realize their real intention behind this. Secondly, how can you separate the land features from the country who owns it? In appearance, the ruling was not on China's sovereignty, but in the essence, it says you can't claim sovereignty and maritime rights. We regard the South China Sea islands as a whole, but they single out each feature. They want to piecemeal China's sovereignty one by one. The ruling actually deprives China of our sovereignty over the islands. I think their aim is obvious. They also deny China's historical rights. The dotted line is one of them. Such denial goes against the basic principles of the UNCLOS. The UNCLOS respects the historical entitlements. China made exceptional declarations to exclude any compulsory arbitration on matters concerning maritime delimitation and historical rights. The exceptional declaration has been made not only by China but by more than 30 countries including the UK. Why does the UNCLOS accept the exceptional declaration? This is because they do not want to create a problem for a sovereign state. The whole purpose of the UNCLOS is for sovereign countries to live in peaceful environment with regard to maritime delimitation. Kerry Brown: We are extremely grateful for you to bring China's perspective on the South China Sea. 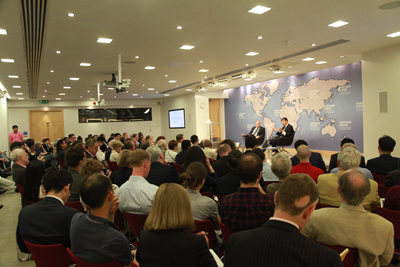 We hope you will have sixth and seventh time to speak at the Chatham House in the future. Thank you very much.